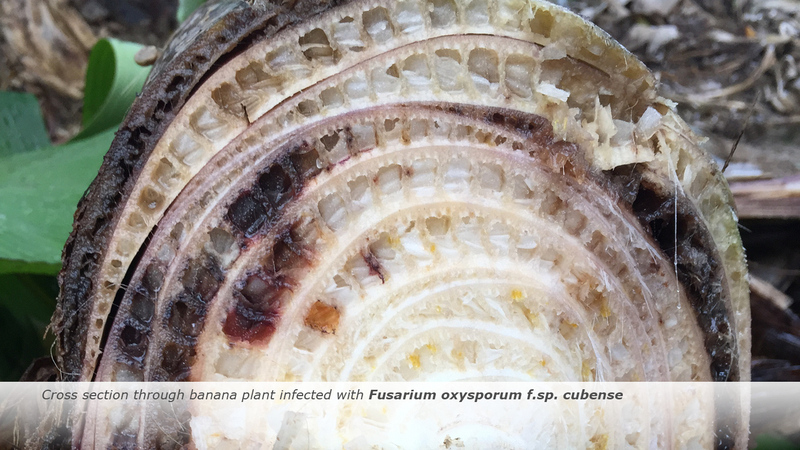 Fusarium wilt (Panama disease) is caused by the fungus Fusarium (the full name is Fusarium oxysporum f. sp. cubense). It is a soil pathogen which infects the root system and goes on to colonise the plant through the vascular system – hyphae of the fungus can even reach the leaves. The disease cannot be controlled or cured other than by soil treatments, which unfortunately have such a detrimental effect on the environment that they are prohibited almost everywhere. plant, and kill it. In other words, soil that has been contaminated once becomes unfit for future banana production unless resistant varieties are grown. Gros Michel used to be the prime banana cultivar until it succumbed to the historic Fusarium wilt epidemic (the Fusarium strain which affected it is called ‘Race 1’ and is almost omnipresent globally) in Latin America in the 1950s. 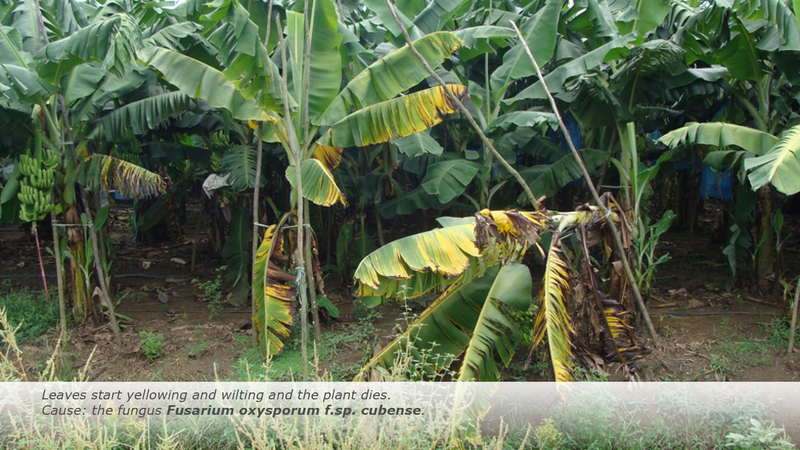 Banana plantations were completely destroyed, abandoned and started afresh in areas that were still free of Fusarium wilt. However, due to a lack of understanding of Fusarium epidemiology and improper sanitation methods – and even after areas were inundated to kill Fusarium – such new areas were also quickly infested, which resulted in the epidemic spiralling out of control. 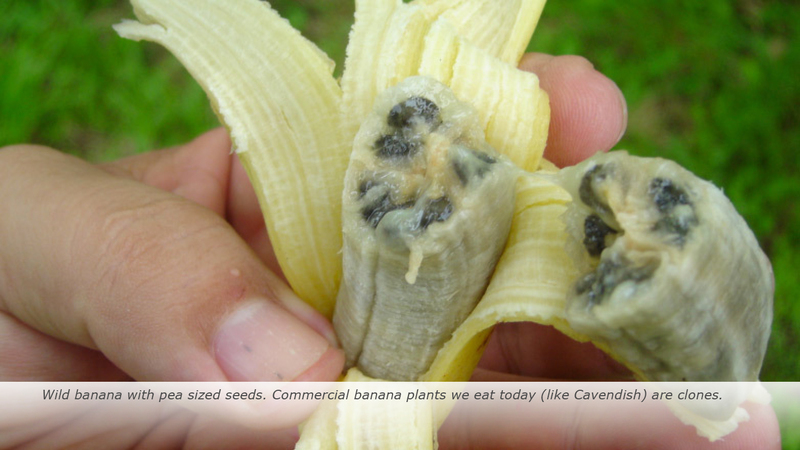 Fortunately, a replacement with Fusarium resistance emerged in the early 20th century and banana producers slowly adopted this new cultivar – the Cavendish banana. The price was high, however: Cavendish bananas are delicate in transport and prone to bruising. The chain had to be entirely tailored for its national and international transport. In addition, the taste and size of the Cavendish are inferior to Gros Michel. 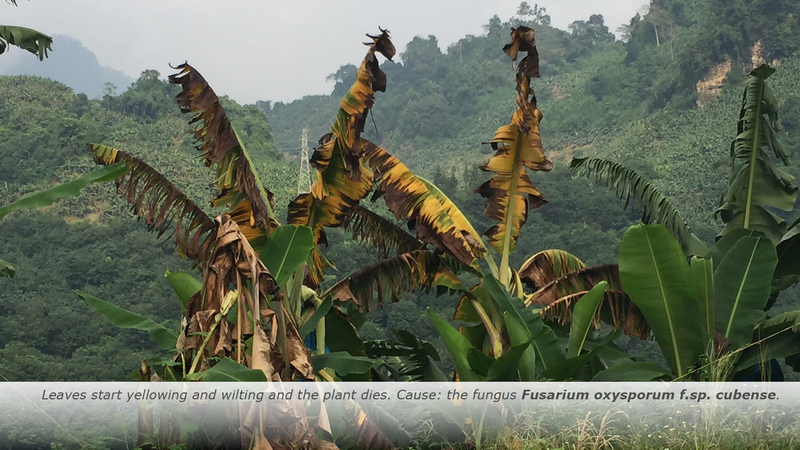 Since the 1990s a new strain of the Fusarium fungus – the so-called Tropical Race (TR) 4 – has occurred and spread, destroying ten thousands of hectares of plantations of Cavendish bananas. business and livelihoods. Bananas are an important cash-crop for millions of people, enabling them to send children to school and support their families. 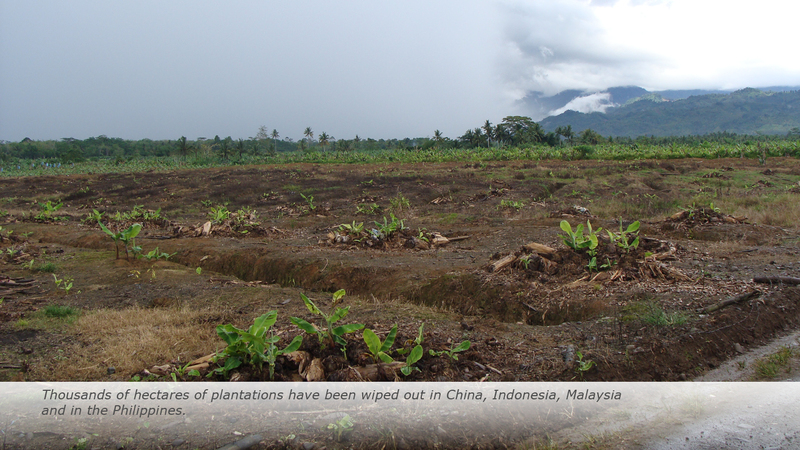 Fusarium wilt therefore threatens to cause widespread poverty. In addition, Fusarium wilt does not, of course, respect borders. 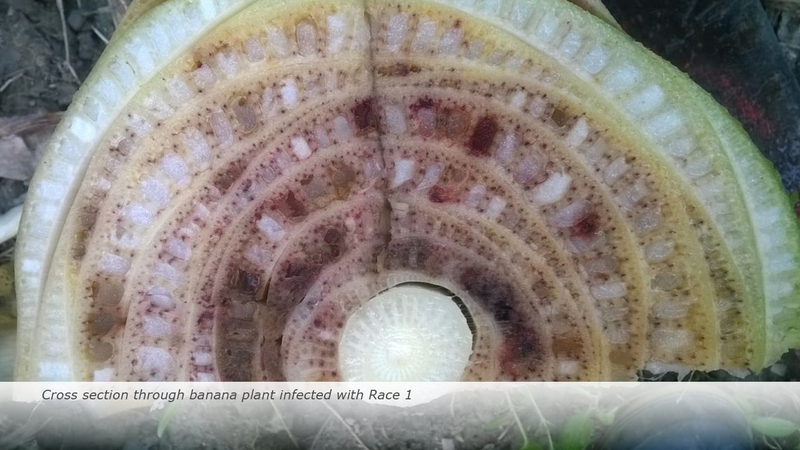 Due to globalisation and the fact that the disease is easily transmitted by soil, water and, probably, air, dissemination of the TR4 Fusarium type to the other important banana production regions (Africa and Latin America) seems to be just a matter of time. 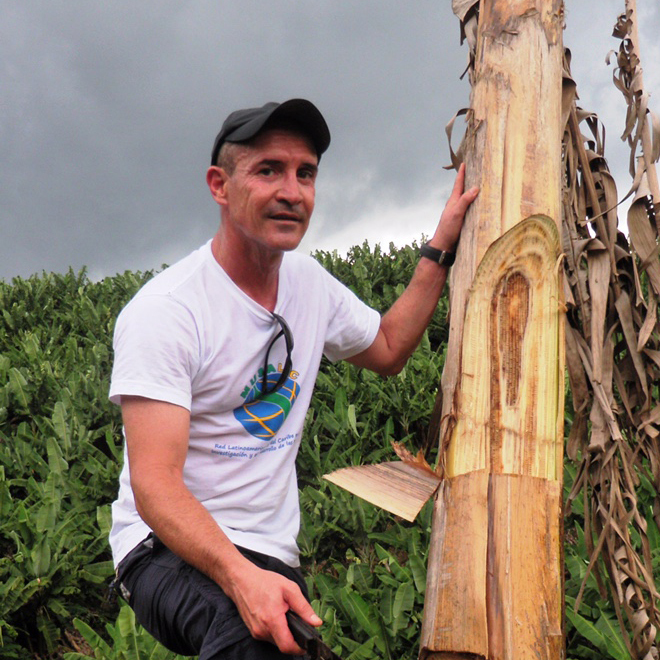 Quite simply, despite the world’s best efforts and major investments, scientists still don’t know enough about the biology and genetics of the causative fungus; and the other challenge is the need for greater genetic diversity among banana cultivars. This would prevent the disastrous epidemics that threaten the entire current production. Thus, first and foremost, a disease resistant banana is the best basis for a healthy banana. As long as we keep growing susceptible cultivars, this is labour lost in terms of disease control. or bio-control based on organisms found in so-called ‘suppressive soils’. While crop diversity in general helps substantially in managing disease outbreaks, Fusarium produces resting spores that survive in soil for decades – in other words, current eradicant measures are needed to control Fusarium wilt. The entire industry involves millions of people directly or indirectly associated with banana production and trade. In Costa Rica alone, nearly 100,000 jobs rely directly or indirectly on banana production – that’s about eight percent of the country’s total employment. to represent potential disease foci. Fusarium wilt therefore acts on different scales: Plant, field, farm, region, country and even continent. State-level & international cooperation and integrated research are indispensable to finding solutions in all of these domains and scales. 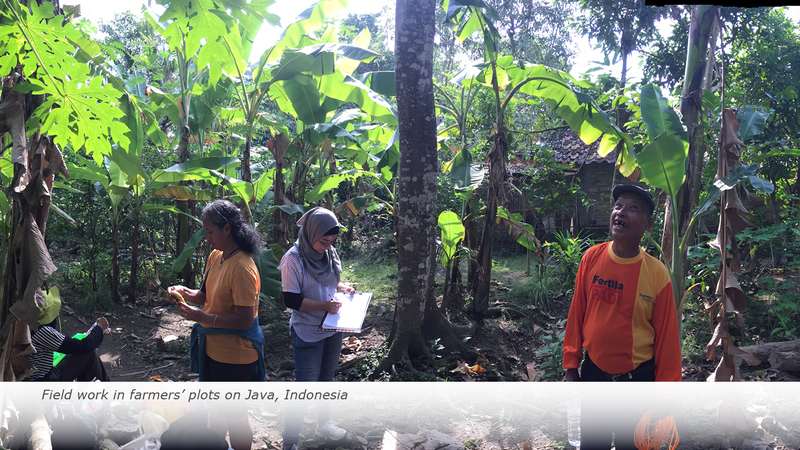 This requires multilevel solutions, as well as concerted action on the part of all stakeholders as both smallholders and plantation owners suffer from the same problems. Cooperative research and knowledge exchange on all levels are indispensable. Effective disease management requires concerted action in a complex environment with different geographical and cultural dimensions. National and international regulations and policies are crucial to managing Fusarium wilt and to preventing its dissemination to areas that are still free. Here you can find information on Fusarium wilt research programmes and their constituent projects. 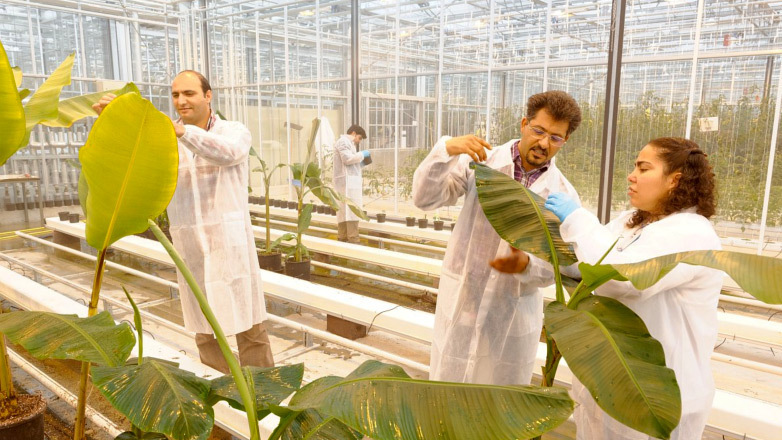 Growers, researchers, commercial companies and government institutions are working together on crop protection, food security and innovation. 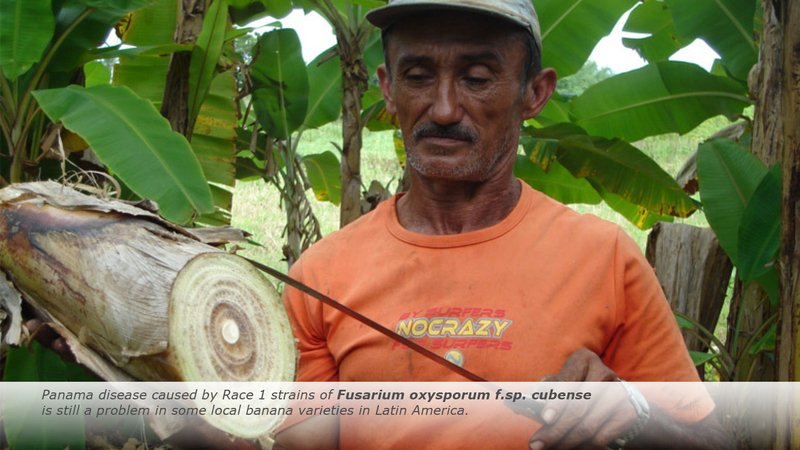 This will help to manage the dissemination of the deadly Fusarium fungus and sustain the livelihoods of the millions of people who depend on the banana. 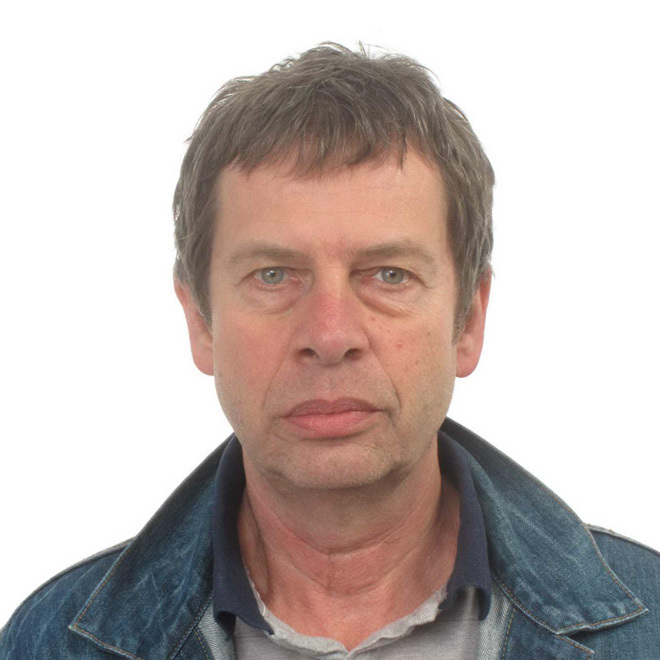 President of the Executive Board of Wageningen UR. 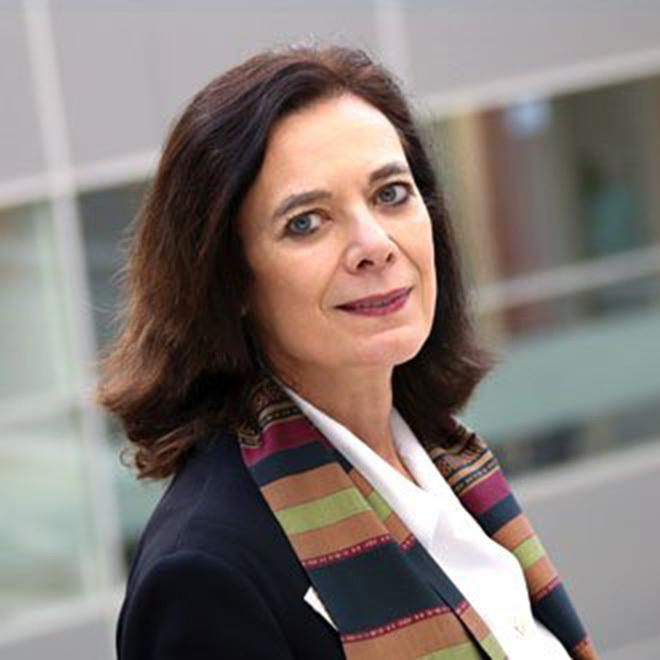 Former Assistant Director-General, Agriculture, FAO and Professor at the University of Amsterdam, the Netherlands. 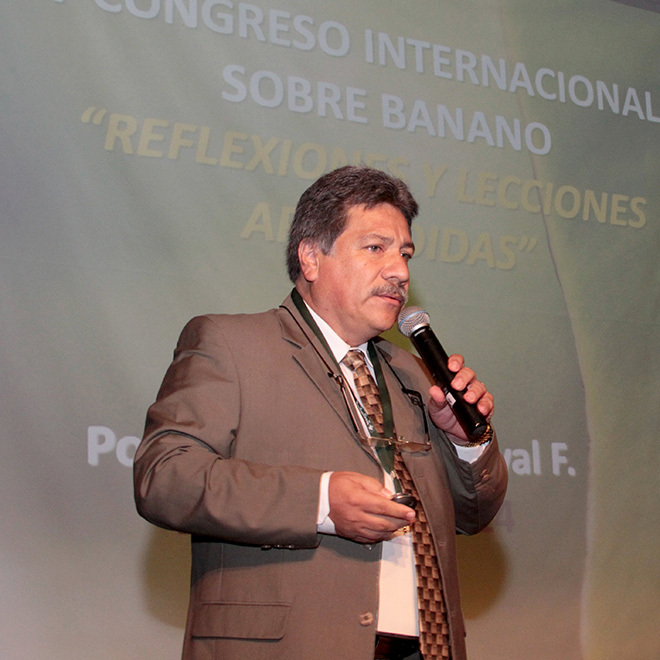 “Aware of the economic and social threat represented by Fusarium wilt caused in Cavendish bananas by tropical race 4 (Foc TR4), CORBANA, its partner regional institutions and other main actors in Costa Rican banana industry have initiated a multilevel prevention campaign. Aiming to preventing Foc TR4 from reaching the continent in a variety of different ways. The campaign contains behaviour guidelines and communication.